For the first time in Canada, an exhibition of 30 paintings by The Florida Highwaymen is on display at SAW Gallery in collaboration with the Embassy of the United States. Their art will last for a long, long time. It stands as an example for civil rights, perseverance, and I say it’s a living example of the American Dream. In commemoration of Black History Month, the exhibit celebrates the work of African-American landscape artists who formed as a group of amateur painters in the mid-1950s in Fort Pierce, Florida. Mentoring one another, the original 26 members (including one woman) faced significant racial and cultural barriers at a time when segregationist policies ranging from public schools to swimming pools were a contentious issue. And because galleries wouldn’t accept their work, The Highwaymen sold much of their work on fences, trees, and out of trunks along U.S. Route No.1. Vivid colours of the Florida landscapes depict quiet rivers, moss hanging from trees, as well as brilliant sunsets and sunrises that would otherwise obscure the perseverance and determination of the artists. “Nobody was recognizing these artists for what they are or what they did,” says Tony Hayton, a passionate art collector who lives in Ottawa and loaned 30 of his Highwaymen paintings to the gallery. “Nobody was calling them the last great American art movement of the 20th Century, which they are,” he adds. New portraits for each of the 26 Highwaymen also overlook the exhibit and were painted by Ottawa’s Peter Schmelzer. “I haven’t met enough of [the Highwaymen artists] but I have met quite a few of them,” Hayton explains. 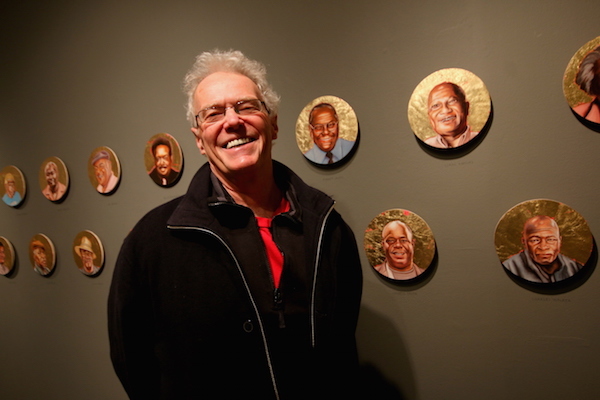 Hayton says that about 14 of the original artists are still alive and he points to the portrait of Sylvester Wells, a preacher who is now in his 90’s and blind. Hayton, who is Ottawa’s link to The Florida Highwaymen — and possibly Canada’s connection too — reveals how these paintings have changed his life over the past 16 years. Apt613: You’re a former horticulturalist and fuel conservation expert. 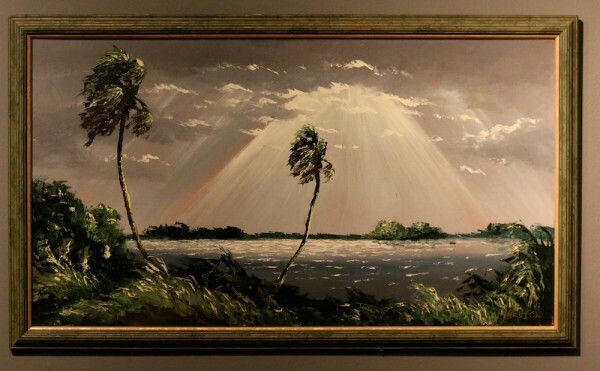 Take us back to when you were first introduced to The Florida Highwaymen paintings. Three Birds by Al Black. Hayton explains that a defining characteristic of Al Black’s paintings is three birds that represent the Father, the Son, and the Holy Spirit. Tony Hayton (TH): It was the summer of 1999 or 2000. I was an environmentalist and I was attracted to marine art, and landscape art. And I was online [Hayton points to a painting at SAW Gallery that resembles one he had seen on the internet]. I bought 35 paintings [online]. I didn’t see a single one. I took a chance. My spouse at the time, she said, ‘I know you’re kinda crazy, you’ll probably do it, and I did.” [laughter]. So I drove down to Florida and picked them up. And so I had an instant collection that I’ve added and subtracted ever since. Apt613: Is there a Canadian connection other than you? TH: [Laughs]. Well, there’s always a Canadian connection between Florida and Canada [he explains the allure of Florida as a warm destination for Canadians]. As far as the actual art itself and what I’m trying to do with it, with the help of the U.S. Embassy and with the help of a lot of other people along the way; we’ve been able to get some traction but not enough. And not deservedly so for the art and the artists. I kinda go ‘why am I the guy who is doing this?’ Why am I the guy who is teaching Americans about their history and their culture. I almost gave up in May. I went down to Washington and I was going to see if I could step away from the art and maybe liquidate it. 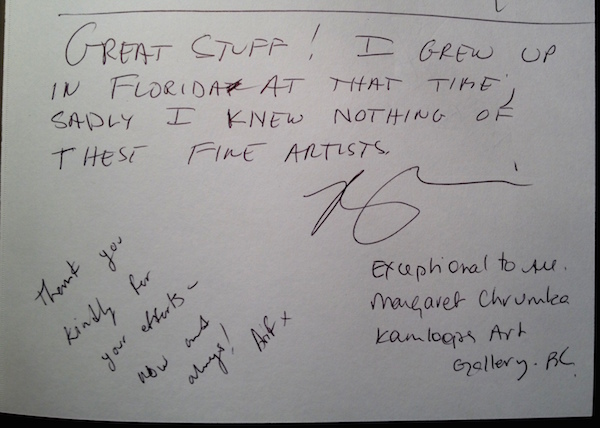 Guest book at SAW Gallery. Apt613: You were invited to attend the First Lady’s Luncheon with Michelle Obama in 2011. Tell us about that. TH: It was decided that The Florida Highwaymen should be part of that luncheon, so the only lady artist of the group, Mary Ann Carroll [now 76-years-old], and her daughter [one of seven children that she raised as a single mother] were invited. I was supposed to meet Mrs. Obama that day but Mary Ann [and her] daughter did instead. I was upset at the time [laughter]. But for me, [Mary Ann and her daughter’s experience] meant more. Apt613: Why are the paintings important? People are enthralled by the art but I think that the real kicker is the story. [Hayton also notes that the artwork is supported by Sierra Club because it offers an environmental statement]. You’d be hard-pressed to find places with these landscapes now. Basically, [the paintings] looks like Florida untouched by man. All of this land we see here is under stress and the wetlands are endangered due to development, new highways, new shopping centers, and new homes. A friend in Florida [Jeff Cook] and I talk about ‘the steak and the sizzle’. The steak is the actual art itself and the sizzle is the story about the art and the artists. I think it’s a bit of both. People are enthralled by the art but I think that the real kicker is the story. You always thought that this story is a civil rights story. The artists, they weren’t thinking about it like that. They were just trying to put food on the table and pay the rent. But the reality is that they were doing something different and unique. They were standing up for their rights, and for their privileges, and doing it in a simple yet communicative way. Rays from on High by Harold Newton. The Florida Highwaymen exhibition is in collaboration with the Embassy of the United States and includes a collection of 30 original paintings loaned by Tony Hayton and selected by curator Guy Bérubé. The exhibit runs at SAW Gallery (67 Nicholas Street) until Monday, February 29th. Admission is free. Visitors to the exhibit in Ottawa will have the opportunity to meet Tony Hayton on Saturdays from 2-4pm. 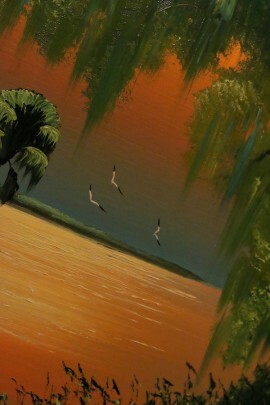 A permanent exhibit for The Florida Highwaymen is in Orlando Florida.